In every draft class there are a few players from a few different parts of the hockey world that seem to be good candidates for teams to buy low on. These players are usually ones that have all the attributes to be a strong performer at their level, but just haven’t yet pulled them all together yet. 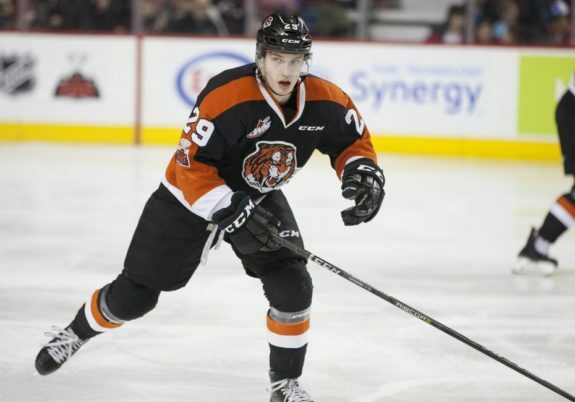 Arguably the best “buy low” Western Hockey League prospect in the 2018 NHL Draft class is Medicine Hat Tigers winger Ryan Chyzowski. The reasons to be excited about Chyzowski are multiple. He’s got a big frame but doesn’t yet play “big.” Even with his frame, he moves around well and has effective acceleration and on-ice speed. He has good awareness and positioning in all three zones, but these qualities haven’t clicked into place and translated into monster offensive production yet. That said, he made a big leap from a 12-point rookie WHL season in 2016-17 to a 52-point season in 2017-18, so he’s making progress. The big gap in his game right now is his performances run hot and cold: he either puts together a multi-point effort and is impressive, or he’s quiet enough as to be near-invisible. He doesn’t hurt his team when he’s “off,” but when he’s good, he’s really good. There’s nothing about Chyzowski’s game that screams “elite” right now, but he’s already established himself as an effective WHL scorer and his collection of physical and intangible attributes suggest that there’s a higher ceiling there. The gamble for scouts is how high that ceiling can be and whether Chyzowski can attain it. Worst-case, he has the disposition of a player that will be a useful depth player in the pros. Best-case, he could become a depth scorer in the big leagues. An NHL organization with enough depth to roll the dice on his potential could be handsomely rewarded. 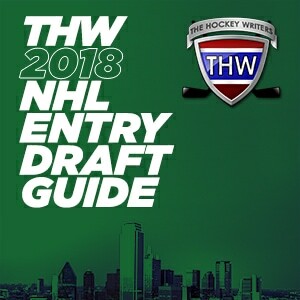 Chyzowski could be selected as early as the third round, if a team’s gung-ho about his potential, or slip as late as the fifth round, if teams are a bit more cautious about his ceiling. Chyzowski projects as a bottom-six two-way winger. If his offense keeps developing, he could become a very useful third line scorer. Chyzowski represented Canada at the World Under-17 Challenge.